This is yet another fabulous recipe from my mother. It is very easy to make and tastes awesome. This is a perfect sweet during festivals. It gets cooked fast and tastes delicious. Crack open the eggs in a bowl and beat using an egg beater or a whisk or fork till frothy. Then add sugar and continue beating till the sugar dissolves and bubbles are seen. Now heat oil in a pan, add the nuts, and stir for a few seconds. When the raisins are about to puff up as a balloon and the cashews turn slightly golden, add a pinch of turmeric powder and stir for a few seconds. Then add the egg-sugar mix and stir well. Add cardamom powder and continue stirring the halwa for about10 minutes or till oil starts separating and the raw smell of the eggs is gone.Continuous stirring is essential as the halwa has a tendency to stick to the pan. 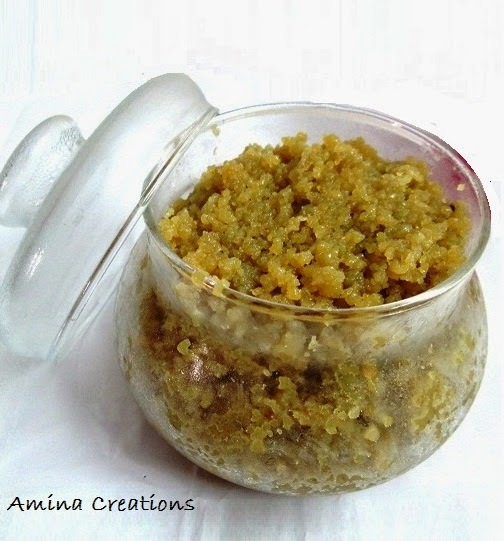 When the halwa is cooked, switch off the gas, allow it to cool and transfer to serving bowls. You can serve it as it is or allow it to come to room temperature, refrigerate for 2 to 3 hours and serve cold.